An existing Andritz twin wire press will be converted from an LC to an MC headbox. © Andritz. Andritz is to undertake a major reconfiguration of the TMP (thermo-mechanical pulp) peroxide bleach plant at Kruger’s Trois-Rivières Mill in Québec, Canada. 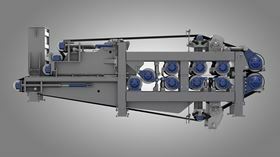 The Andritz scope of supply includes delivery of a new HC mixer, a HC bleach tower discharge system, two MC pumps, one reconditioned pulp screw press, the upgrade of two existing twin wire presses and the modification of an existing Andritz twin wire press. Basic engineering, erection supervision, as well as commissioning and start-up assistance are also part of the Andritz scope. Start-up is scheduled for the final quarter of 2018. Kruger and Andritz have a longstanding business relationship.